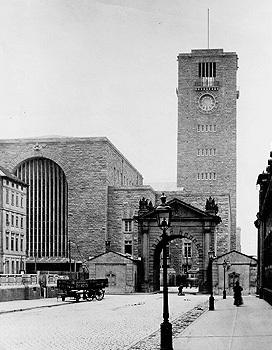 Towards the end of the 19th century, railway traffic increased greatly, so Stuttgart needed a bigger and better station. After long investigations concerning the new location, King Wilhelm II of Wuerttemberg decided on today´s location, in front of the city gate. Alternatives such as moving the station to Bad Cannstatt in the Neckar Valley, or creating a through-station with an extensive tunnel system, were investigated but rejected, since 95% of travellers named Stuttgart as their destination.